2019: Lowes Wong School, Bleasby School and hopefully, St Michael's School in Farnsfield are being sponsored by our club to take part in this year's competition which kicks off in September. We wish all the children well and are sure they will have great fun in taking part. ​We are delighted that Bleasby CofE Primary School took up the challenge and entered the 2018 competition last year, sponsored by our club. Evie Davidge, Molly Harrison and Olive Dunsworth were the 3 pupils making up the team that represented Bleasby School in the ROAR 2018 regional final in Nottingham. Bleasby school took full advantage of the challenge, everyone in the school took part and produced some stunning ideas. The winning team from the school came up with the idea of producing a wheely bin that is made from bottletops, not currently recycled. In addition the bin would check what was being put into it and tell you if it was the correct bin. The bin was also able to go to you via remote control so that disabled people could use it as well. Their presentation at the final also included business cards, which they gave away, and a very professional powerpoint display on computer. All the work was done by the girls and their 'jingle' was especially catchy. All had a very enjoyable day and everyone was pleased with their work. Roar2018 is an exciting IDEAS competition for Key Stage 2 students of Primary Schools and is being run and organised by the IDEAS company 7billionideas in partnership with Lions clubs in the UK. ​A Teacher's Pack from the 2017 competition explains in more detail how it works. ​If your school would like to enter this year or be considered for next year's event please contact us. 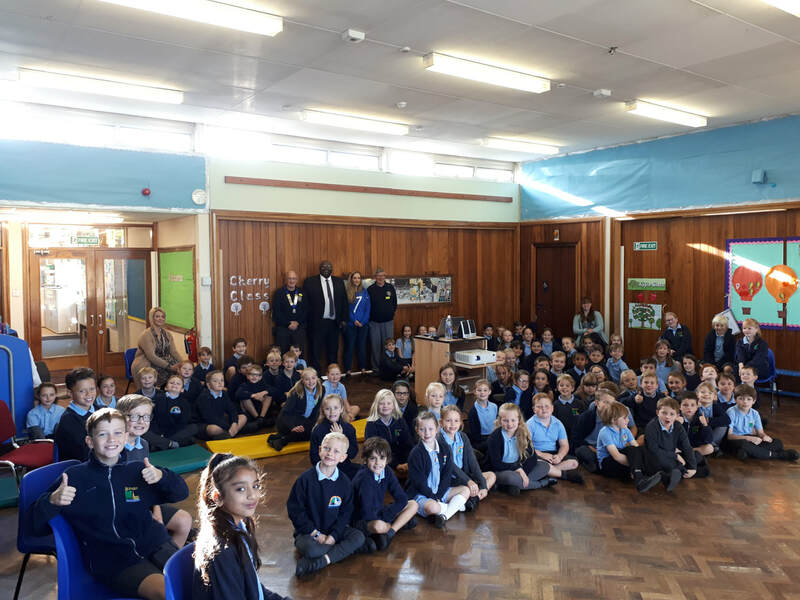 Bleasby School children, with their new Head, Sam Mensah, and Lions President Verdun Webley & Lion Roger Eastty at their school's ROAR presentation on 25th Sept 2018.